Home Mammals Can Mice Swim? Mice are extremely adaptable mammals. They can survive in almost any kind of environment. Not only this, they are excellent climbers, jumpers and incredibly fast runners too. Since they are nocturnal animals and they cannot see fairly well in the dark, they tend to make up for their poor eyesight through excellent hearing and smelling powers. They can hear high frequency sounds with a range of 1 kHz to 70 kHz (just to put it in perspective, humans cannot hear sound waves above 20 kHz). This makes most of us to wonder can mice swim too? Well, they certainly can, but first off, you must know that these little creatures are incredibly agile and flexible rodents. Yes, mice can climb stairs and walls quite easily thanks to the sticky little claws that fit perfectly into the tiny cracks within walls. What’s more amazing, they can jump up to almost 12 inches from the floor which means they are much more athletic than you could ever imagine. Despite their small size, they can run off at an astonishing speed of 8 mph which explains why they are hard to catch up and you rarely catch a glimpse of them scuttling across the floor. Last but not the least; they can move through electrical cords and wires by balancing out their weight through their long tail. Can Mice Swim or Not? If Yes, then How Long? 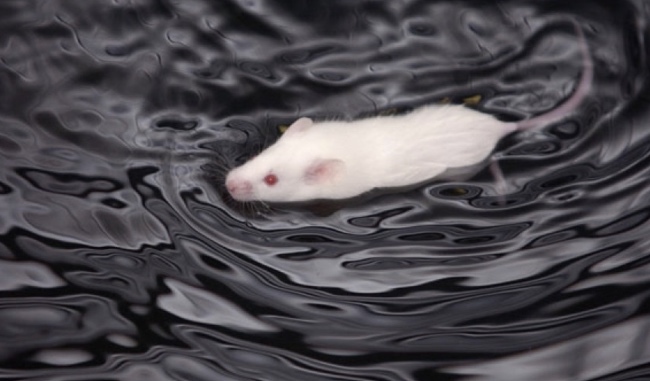 Mice can swim for sure and they seem to have natural ability to do so. Since they are highly flexible and adaptable animals, they can swim around fairly well. Amazingly, they can tread water for as long as 3 days. One of the most impressive feats of these animals is that once they are completely underwater, they are still able to survive by holding their breathe for about 3 minutes. Despite the fact that mice are very good swimmers, they do not really seem to enjoy swimming at all.